The iconic birthplace of basketball in Belgrade is the inspiration for the exciting new official logo of the 2018 Turkish Airlines EuroLeague Final Four. The best weekend in world basketball is coming to the Serbian capital from May 18 to 20, marking the first time that one of the greatest global hotbeds of the sport will host the event. 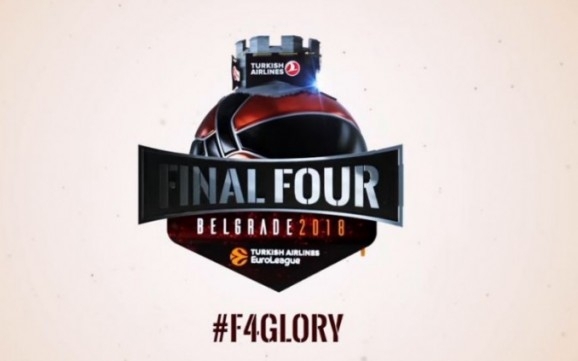 Appropriately, the logo fuses some of basketball’s most recognizable elements with Belgrade’s most iconic building, the Kalemegdan fortress, whose castle tower overlooks the design just as it overlooks the city. The Kalemegdan fortress is perched on a cliff above the confluence of the Danube and Sava rivers, a privileged spot that has also been central to basketball development in the city. The fortress walls act as guardians of several basketball courts and were witness to some of the greatest players and games in European basketball history. A classic arena screen cube sits in the middle of the logo, highlighting the FINAL FOUR type, which represents the top four clubs that will be competing for the continental crown in May.